Successfully Added Mini Car DVR with 2 Inch Screen (Motion Detection, Nightvision) to your Shopping Cart. Mini Car DVR with 2 Inch Screen: Capture high quality videos with this compact and convenient video recorder with motion detection and nightvision! 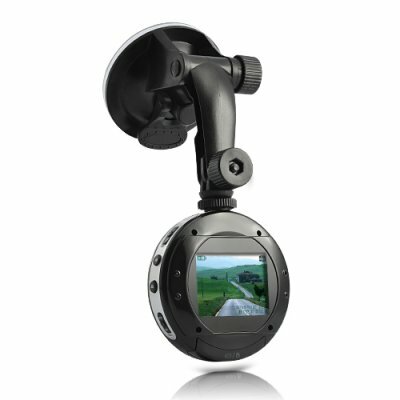 This Mini Car DVR is perfectly shaped to be easily and safely placed on your windshield or on top of the dashboard to accurately document and collect evidence for insurance or court purposes, monitor, record in session or just to get memories of beautiful landscapes while driving. Equipped with 24 powerful IR LEDs, record the surroundings during both day and night time. This ingenious video recorder comes with a 2 inch screen allowing you to see in live what you are recording. A good help to adjust the viewing angle and make sure you are pointing at the right direction. It also means no more stress when you are about to check taken videos since you will see exactly what you want. Free your hands by fixing the mini DVR on any support. The suction mount makes it ultra convenient to record anything effortlessly and safely. With its discreet design and motion detection recording ability, you can use it to record video automatically. Watch out would-be burglars! This versatile Mini Car DVR with 2 Inch Screen is an indispensable gadget for driving and also a pal for your daily life. Order it right now while supplies last and receive it in a few days. All this is brought to you at a factory direct wholesale price by your best source of digital cameras and recorders, Chinavasion. When car charger is plugged in and light strength is lower than 5 LUX, infrared function automatically turns on.